Dr. Elizabeth Holland offers a full range of eye care services, including the diagnosis and treatment of diseases of the eye, utilizing the latest state of the art equipment. These services include routine annual eye exams, diabetic, glaucoma, macular degeneration and cataract evaluation and treatment, contact lens fittings and follow up, and the treatment of dry eyes and blepharitis. Dr. Holland recommends that all patients over the age of 50 should have routine annual eye exams to diagnose diseases of the eye, as usually during this time glaucoma, cataracts, and increasing dependence on glasses can be developing. Diagnosing and treating these conditions early can prevent vision loss. Under the age of 50, eye exams should be performed every two to three years. If you wear glasses or contact lenses or have a family history of eye disease, you should be seen annually. Cataracts result from a clouding of the lens inside the eye. The vision changes from cataracts can be so gradual that the patient does not even realize that they are losing vision. The first symptoms of cataract might be glare at night or blurry vision. If you have already been diagnosed with cataracts, yearly exams are recommended to document changes in your vision and to ensure that the cataracts are not progressing. If the cataracts are progressing and affecting your vision, Dr. Holland is an accomplished cataract surgeon and can discuss your surgical options. The most advanced implant technology can be used to replace the cataract at the time of cataract surgery. These include monofocal (distance) lenses, multifocal lenses, and accommodating lenses. If you have diabetes, you should have your eyes examined every year to detect early changes of diabetic retinopathy. Patients with diabetic retinopathy should also be seen yearly and sometimes more frequently to carefully document changes in the retinopathy to avoid vision loss. Dr. Holland has the latest in digital retinal photography that can be utilized to document any changes of retinopathy between examinations. Glaucoma is a potentially sight threatening disease, where high or normal pressure in the eyes can cause damage to the optic nerve affecting the peripheral vision. Most people do not even realize that they have glaucoma. With early detection, glaucoma can be treated to prevent vision loss. Routine screening is recommended to check the pressure and examine the optic nerve for disease. 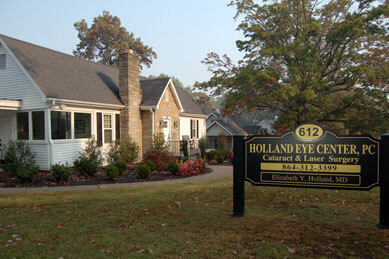 If any abnormality is diagnosed, Dr. Holland may recommend additional testing to check for glaucoma. If you already have glaucoma, Dr. Holland has the latest in visual field technology, digital photography, and optic nerve visualization to document progression of the disease and recommend treatment modification as necessary. Macular degeneration is a progressive aging change in the central seeing part of the eye, the macula. Drusen and pigmentary changes develop in the retina, which affect the central vision. New blood vessels can develop in the diseased retina which can cause a rapid decrease in vision. Dr. Holland has the latest in digital retinal photography and retinal imaging to detect these changes early to prevent vision loss. She may recommend at home monitoring with an Amsler grid and vitamin supplements to reduce the progression of the retinopathy. If the macular degeneration progresses to the “wet form”, referral to a retinal specialist may be required. Dry eyes and blepharitis affect a large percentage of the population. Especially with the increase in computer usage, dry eyes can be very bothersome. Dr. Holland has a special interest in the treatment of blepharitis, an inflammation of the lids of the eyes and dry eyes. She may recommend lid hygiene, drops, and vitamin supplementation for treatment of the dry eyes and blepharitis. If you are currently a contact lens wearer, your eyes should be examined yearly to ensure that the contact lenses are fitting well and providing the best vision. Alternately laser vision correction might be an option for you, and you may discuss this with Dr. Holland during your exam. Come in today for your eye exam.